Lakeside Homes: Rarely available lakefront home ideally located in north Naples at Lakeside. Exceptionally well maintained lake home for sale with panoramic and picturesque lake views with sought after south western exposure. Offering 3 bedrooms, 2 full baths, 2-car garage, with over sized extended driveway providing extra parking for your guests. A welcoming entrance to the home through the screened front entry breezeway into foyer leading into the open and airy living area with 11' ft vaulted ceilings. The home features a glassed-in screen lanai for year round enjoyment. The spacious Master suite has spectacular lake views and access to the lanai, private bath, with walk in shower, separate tub, dual sinks and walk in closets. Large eat-in kitchen with breakfast bar. Lakeside is a gated community, with private Clubhouse, fitness center, tennis courts, play ground, pickle ball court, walking/jogging trail, 2 heated pools and spa. The Lakeside community grounds are impeccably maintained and beautifully landscaped. Call for a private showing. Lakeside Villas Lakeside Homes: Lakeside is one of the most desirable locations in Naples. Rarely available 2BR 2BA Villa with detached garage steps from your front door. PET FRIENDLY COMMUNITY!! Open floor plan with private guest suite, vaulted ceilings, tile flooring throughout living areas and new upgrades featuring neutral paint, European wood flooring in bedrooms, upgraded kitchen with breakfast nook, new granite countertops, designer backsplash and stainless steel appliances. The master bathroom boasts new custom cabinetry, granite countertops and tile flooring with walk-in closet. Owner only in residence 4 weeks per year and never a rental. Enjoy your enclosed lanai with private landscaped views with your morning coffee. Lakeside amenities include 1.5 mile walking path, clubhouse, impressive 40-acre lake for kayaking/canoeing, 2 heated pools/spa, BBQ area, 5 tennis courts, shuffleboard & bocce, basketball & playground. 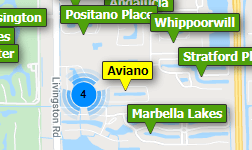 A-rated school district and only minutes to Gulf beaches, shopping-dining and close to 5th Avenue in Olde Naples. List of upgrades attached in supplements. Need professional assistance selling your property at Lakeside Naples? Find out how an Area Specialist can help to generate more property exposure in order to get the most money for your investment in the least amount of time.